We think that Denis Cotter from “Cafe Paradiso” is equally inspired, a genius and slightly mad with his creations. Every dish is constructed as layers of flavours that as a whole are quite engaging and delightful. We loved this dish and each element really adds something extra and delicious. Put the rosemary and zest in a small saucepan with 30g of the butter. Heat gently until the butter starts to sizzle, then remove from the heat and leave to infuse for at least 30 minutes in a warm place. Strain through a sieve and throw away the solids. Stir the flavoured butter into the rest of the butter. Either keep warm or soften again just before serving. Bring the stock to the boil in a large saucepan, then turn it down and keep at a low simmer. In a wide, heavy pan, heat the olive oil and cook the shallots and parsnip for a couple of minutes over a medium heat.Add the thyme, honey and vinegar, then cover with baking parchment, lower the heat and simmer for 10 minutes. The parsnips should caramelise a bit but will stay firm. 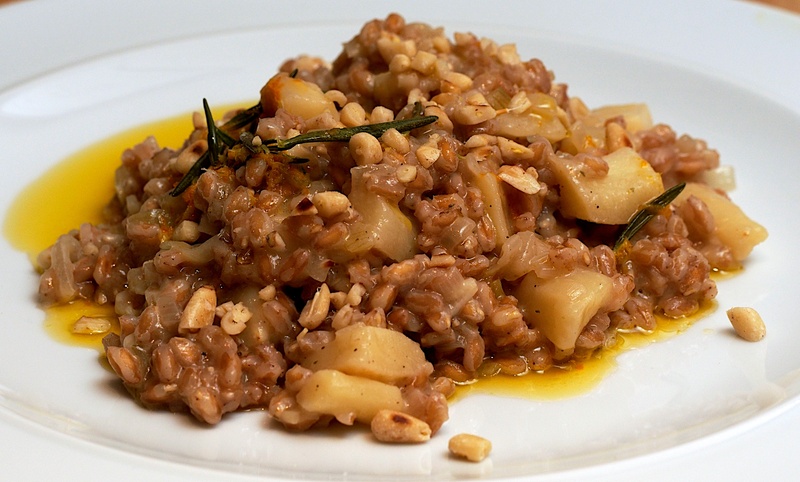 Add the farro and garlic, and cook over a medium heat for 5 minutes, stirring now and then. Remove the thyme sprigs. Add the white wine, bring to the boil and simmer until the wine has been absorbed. Pour in a ladleful or two of hot stock and simmer, stirring occasionally, until it has been absorbed. Keep adding stock in this way for 40-50 minutes, or until the grains are soft and chewy. Stir in the cheese and season well with salt and pepper. Spoon the farrotto into warm bowls, drizzle with the citrus butter and scatter with pine nuts. Wine Suggestion: This dish has some strong flavours so you can’t go for anything too light or you will risk it being overwhelmed. An oaked Semillon from Australia would have the weight, the freshness of acidity and the natural citrus flavours should complement and enhance the dish. We went for Stephanie O’Toole’s Mount Horrick’s Semillon and it was delicious. I really like the look of this, definitely going to try it this week. I only have spelt but I think that’s a decent enough substitution.